Every plant person deals with weeds. Usually the weeds are very different from the desirable plants – ask any cactus/agave person what they think about Oxalis, or anyone with acreage in the country about mustard. In the CP hobby there are plenty of mosses which give people more or less trouble, depending on the pot they're invading. There are also carnivorous weeds – plants that are either deliberately included in a collection, or which arrive unexpectedly in a trade, and then begin to travel around into other pots. Weeds make great plants for beginning growers, since by definition weeds hard hard to kill and adaptable to lots of different conditions. Perhaps the classic CP weed is Drosera capensis (although a couple of terrestrial Utricularia give it a run for its money). D. capensis flowers extensively on long scapes, self-fertilizes, and produces thousands of seeds. Heretofore my D. capensis has produced seed and offsets, but I hadn't caught seedlings popping up unexpectedly. Until a week ago or so. 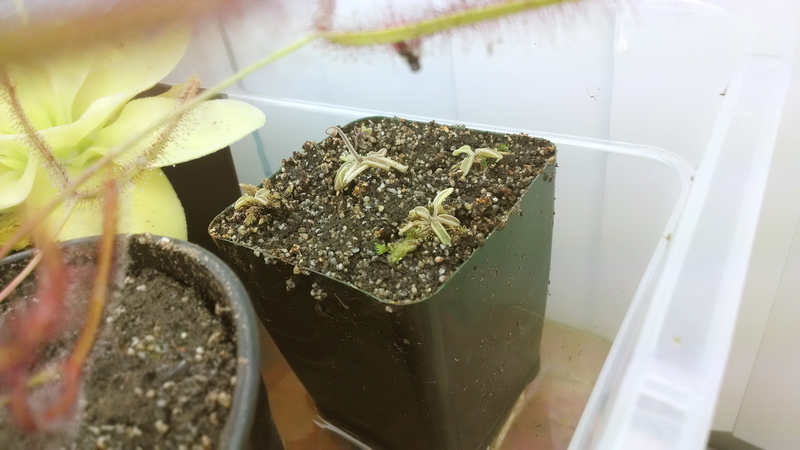 Lots of little tiny D. capensis (I think – they could be D. aliciae). 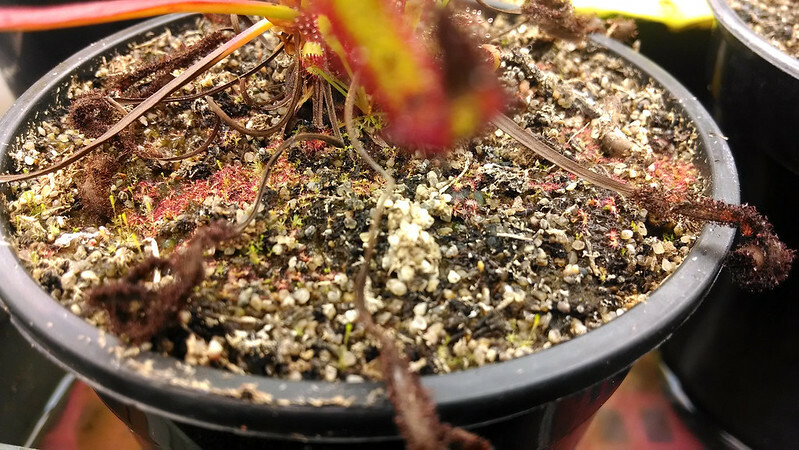 Luckily, this is all in the D. capensis pot. I think the seeds fell out when the stalk got knocked by the lights. 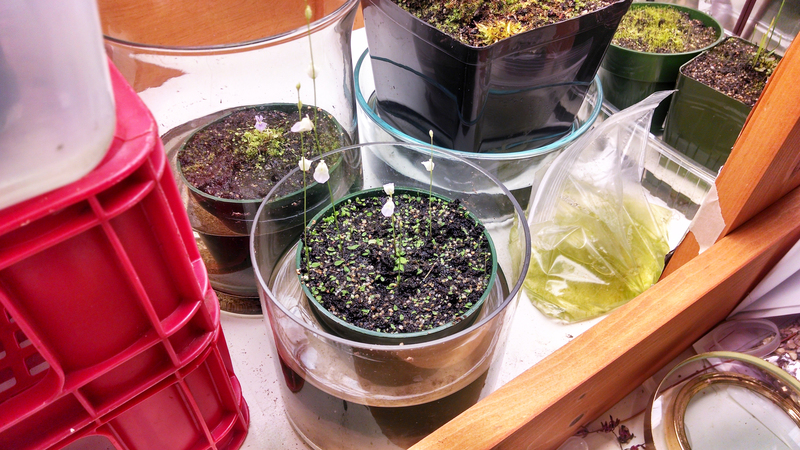 I don't plan on feeding these seedlings, so we'll see how quickly they'll grow. Terrestrial Utricularia make for great weeds, which is why I confine them to their own trays for the most part. While U. bisquamata and U. subulata are probably the most famous Utric weeds (check any Sarracenia pot at a nursery and there's a good chance you'll find some), U. livida is the most vigorous terrestrial Utric I currently grow. 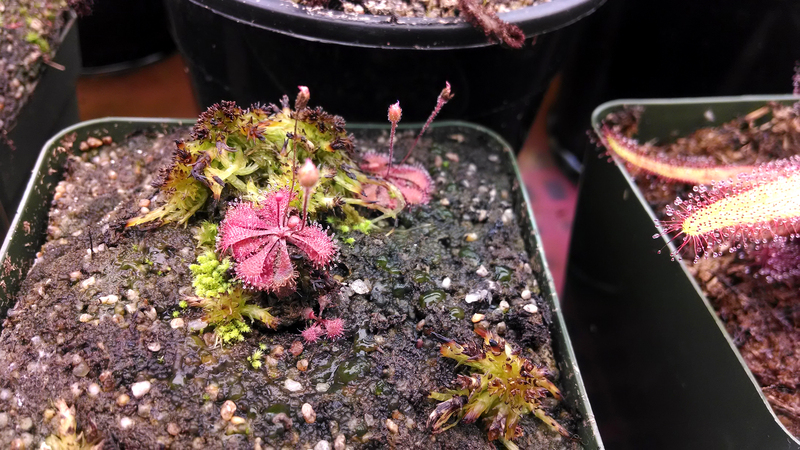 In the 2 or 3 months I've been growing it (check out this post from March) it has filled its pot and started blooming like crazy. Look at this beautiful profusion of Utricularia. Such a neat-looking pot. There are even more stalks coming up. Keeps on blooming! If I put together a mixed bog you better bet I'll throw a couple U. livida chunks in there, but most of the plants in my collection are in single-species pots, so I like to keep things separate for the time being. 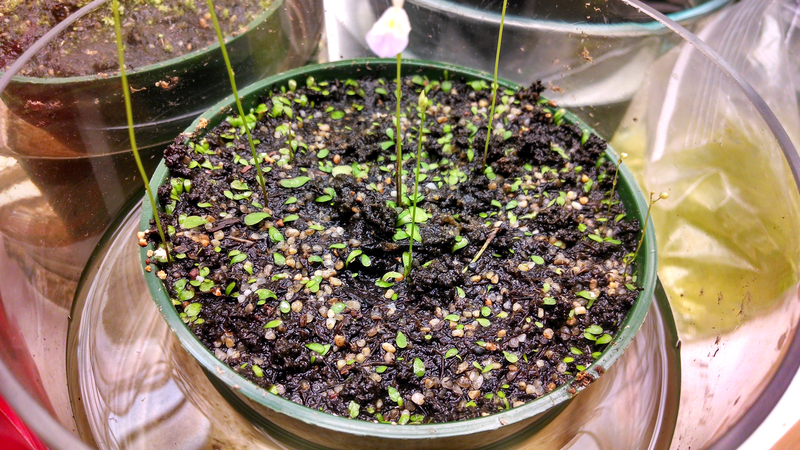 I recently acquired a weedy Ping – Pinguicula lusitanica is a small, self-fertile, freely blooming Pinguicula that apparently likes to travel around a greenhouse. I just got a flower stalk on my biggest plant! I now have two Pings, on totally different size scales. That's always how it starts. These are supposed to be short-lived annuals, going from seed to bloom in a matter of months. Sounds fun! Drosera brevifolia is a not-dissimilar sundew weed – it's tiny, bloomy, potentially annual (although I've gotten the impression they can last a few seasons with consistently favorable conditions), and cute. The frontmost 'dew already has a 3rd stalk coming up. Good job, little plant. I'm gonna try harvesting some of this seed soon, so I can re-sow and get a big colony going. Sundews look great in colonies. Are there any weeds in your collection that you're particularly fond of? Do any give you problems? No weed is mightier than subulata!You dont see that capensis spreading to other continents!Very interesting post. Sarracenia flava just popped its top!